Sometimes January can seem like a long month, but not this year! District 5495 Rotarians have been on fire! Clubs held fundraisers, service projects and events that changed lives and enhanced the quality of life in our communities. Leadership Development was front and center on a District level, with events of like RYLA Camp Pinerock (the first of our two Rotary Youth camps!) and the Rotary Leadership Institute, where 25 members gathered to share and learn! 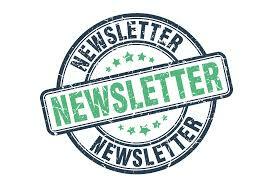 You’ll enjoy reading about the amazing energy and good work of our clubs and program teams in this newsletter. 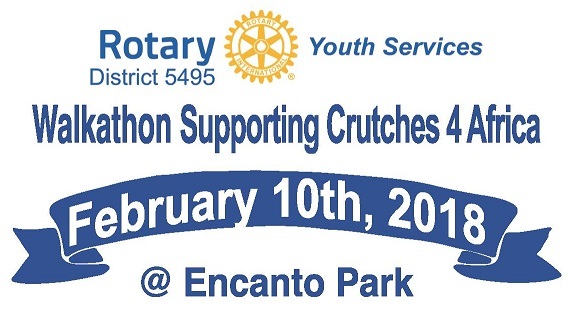 Interact District 5495 is sponsoring a walkathon on Saturday, February 10 at Encanto Park, 2605 N. 15th Avenue, Phoenix. This fun event is designed to be an opportunity for Rotarians, Rotaractors and Interactors to come together for fun and fellowship, and to help raise funds for an Interact project that is enabling our Arizona Interact youth to give the life-transforming gift of mobility to people of all ages in Kenya. These people have have been crippled by polio, and have never been able to stand or walk on their own. The Interactors’ goal is to raise $20,000 for this worthwhile project. For Rotarians and Friends of Interact, you are invited to a special Crutches 4 Africa Hors D’Oeuvres Reception on Saturday, February 24 from 5:30 to 9 p.m. at the DoubleTree by Hilton Phoenix/Tempe. This is the evening after the Interact District Conference. 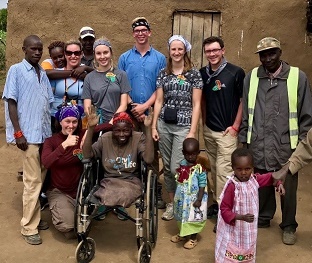 It will be both a thank you and a celebration for all who have helped collect crutches and other mobility devices, and who have contributed in any way toward the Interact Crutches 4 Africa Project’s success. The Glendale West and Peoria North Rotary clubs will hold a joint meeting February 7 featuring David Talbot, founder of Crutches 4 Africa. Members of District 5495 Interact Team that delivered 30,000 devices in Kenya will be in attendance. The meeting begins at 6 p.m. at Huntington University, 8385 W. Mariners Way in Peoria. A social begins at 5:30 p.m. Cost is $10. RSVP early to ensure adequate seating. For more information or to register, visit https://portal.clubrunner.ca/4780/Event/club-meeting-1 and register as a guest. A club’s District Grant project for 2017-18 must be completed, including expenditure of all funds, and the Final Report with all receipts for spending must be submitted by the due date of April 30. In some situations, a credit card/bank statement may be required. To access the Final Report form, go to the District 5495 Website (www.rotary5495.org) and download the fillable form. Complete the form and have the club president sign it. Scan and upload the report and spending receipts to the project website: www.matchinggrants.org. Questions? Contact Don LaBarge or Fred Goldman. 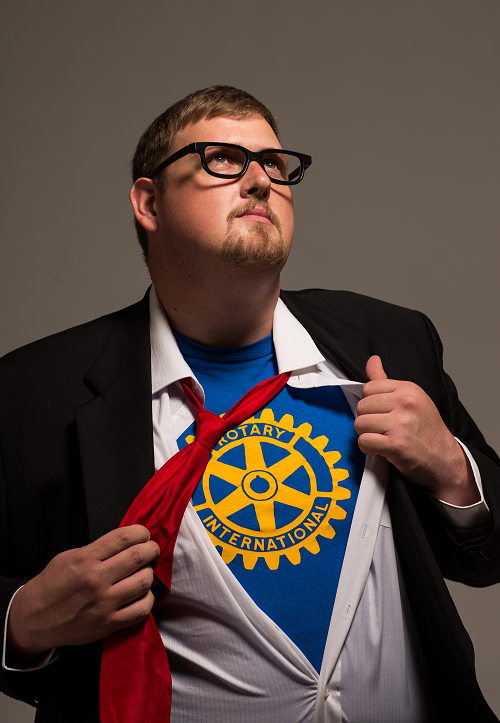 YOUR VOICE CAN BE HEARD at Rotary International, YOU, can make a difference! Do you have concerns about how things operate at Rotary International? Then you may submit a Resolution to Rotary International. What is a resolution? 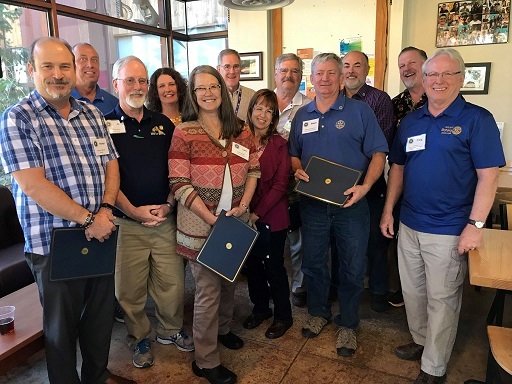 Six Rotary Clubs with 218 members have served the communities of Apache Junction, Chandler, Gilbert, Gold Canyon and Sun Lakes collectively for more than 250 years. Four Past District Governors of District 5510 are members of these clubs. The clubs support student attendance at RYLA and participate in the Dictionary Project. This year, they delivered over 5,000 dictionaries to schools in their respective school districts. They also held a multi-club dinner for the District Governor’s visit to Area 8 on October 25. The 5th annual Interact District Conference is being held this year on Saturday, February 24, at Perry High School, 1919 E. Queen Creek Road, Gilbert. 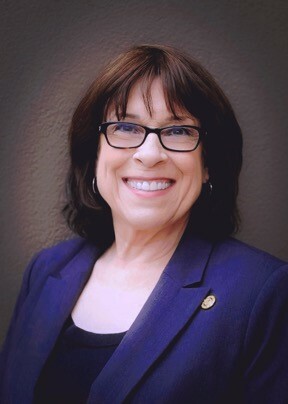 The 20-member Interact District Council, under the leadership of District Governor Loralli Johnson, has been hard at work planning and preparing for this event and its multiple breakout sessions. The IDC is expecting at least 500 Interactors, Rotaractors and Club Advisors to gather in Gilbert for this high-energy, fast-paced one-day annual event. Last year’s Club Leadership Academy received RAVE REVIEWS from attendees. District Grants—Now is the time to start planning your club project in 2018-19 that can be partially funded by a District Grant. These awards are available up to $2,000, with the club funding at least 50 percent of the project cost. The application period for a District Grant starts April 1, 2018 and ends June 30, 2018. District Grant Guidelines for the application process can be found on the District 5495 website: www.rotary5495.org. 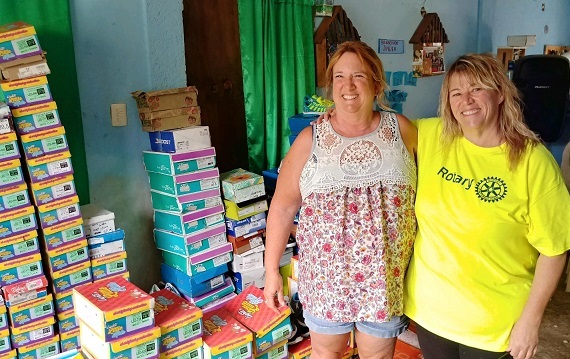 For the past four years, Brenda and Don Gentry from Portage, Michigan, and a few of their friends have travel to Isla Mujeres (Women Island)—12-1/2 miles off the coast of Cancun, Mexico—to distribute shoes to local kids. 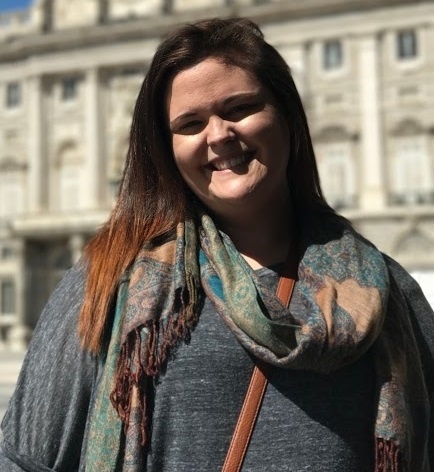 This year, Charlotte Pruett, president-elect of the Silver Creek Rotary Club in Snowflake was honored to be a part of this awesome International Service Project. The distribution started around 10:30 a.m. and continued until all of the 450 pairs of shoes were distributed at about 4:30 p.m. The lines were long and everyone was patient and understanding. Some of the locals even made Tortinitas for the people waiting in the long lines. Thank you Brenda Gentry and Zapatos Para Los Ninos. Here is to many more years of great service projects in Isla Mujeres. 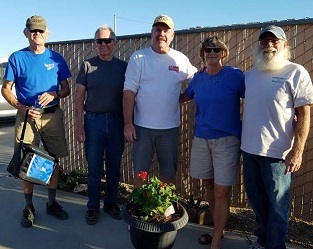 Fellow Rotarians, the San Tan Crown Rotary Club of Chandler is excited to announce plans for their Third Annual “Hooked on Healing Veterans” motorcycle ride to take place Saturday, February 24th. Anyone who rides a bike of any make or model is welcome to join us for a day of safe riding, good food, friendship, fun and games all in the name of charity. Our club Foundation will distribute all excess funds to Phoenix Project Healing Waters and Fans Across America. Please check us out at either healingvets.org or Facebook.com/healingvets. 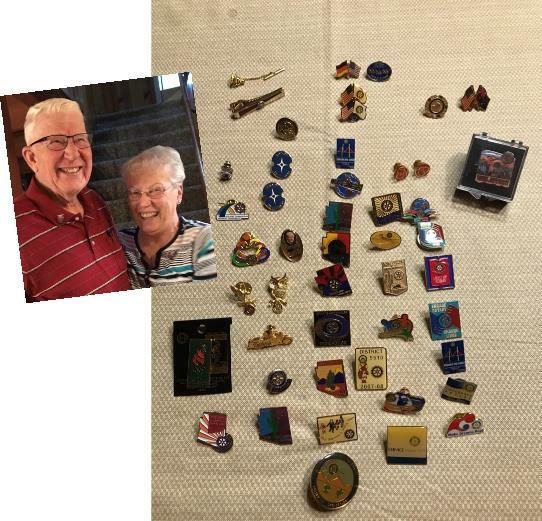 Thank you to PDG Roger Bonngard for gifting DG Nancy with a complete ‘history’ of D5510 – through PINS! What a treasure! Since a similar pin collection probably exists somewhere in the former D5490, let’s find it. Then, let’s create a way to preserve our histories and display them together! Are you a ‘crafter’? A historian? To be involved in this project, read on. RLI sessions 1, 2 and 3 will be offered on May 19 at Prescott College. 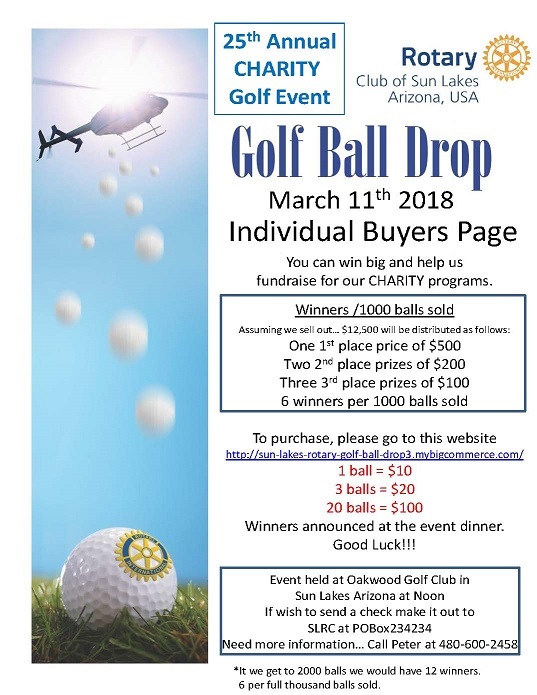 On Sunday, March 11, the Sun Lakes Rotary Club will hold its 25th Annual Charity Golf Tournament at the Oakwood Country Club. This tournament represents the Club’s major fund raiser of the year, allowing it to support numerous charities in Chandler and around the world. For instance, the Club has given dictionaries to more than 48,000 third graders in the Chandler Unified School District; taught over 50,000 ninth graders that the choices they make now, good or bad, will affect their lives forever; given scholarships to high school seniors; taken underprivileged children on clothing shopping sprees; and contributed more than $100,000 to eradicate polio worldwide. One hundred percent of the net proceeds from the tournament benefit these charities. 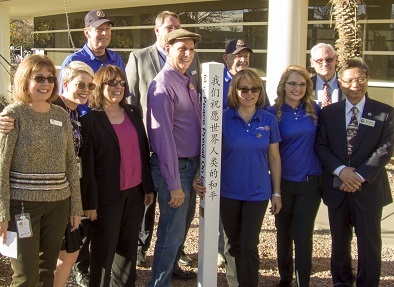 On Saturday, January 13, Chandler Rotary Club dedicated a Peace Pole at Chandler Downtown Library. As we reported previously, a Peace Pole is a hand-crafted monument that displays the message and prayer “May Peace Prevail on Earth” on each side, usually in different languages. On this particular Peace Pole, it is in Mandarin, Hindi, Spanish and English. 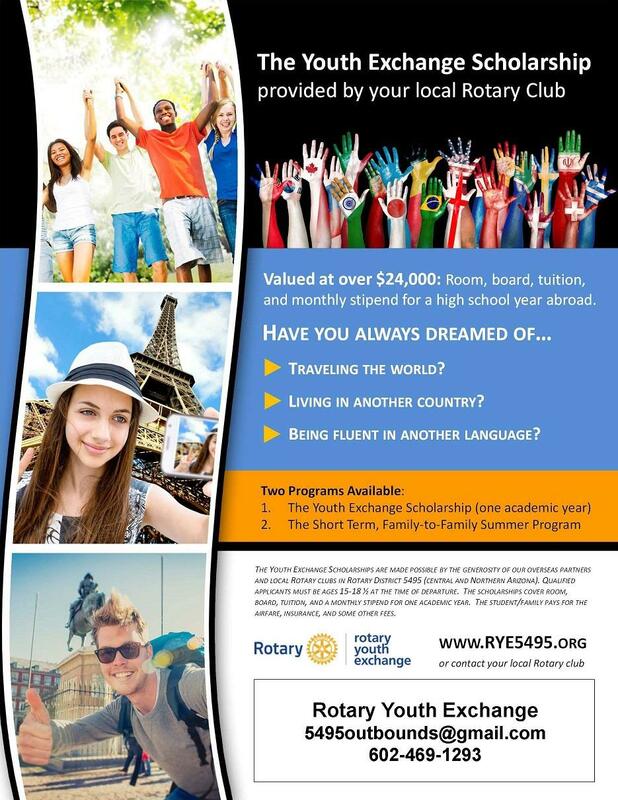 The District 5495 Youth Exchange committee has started branding our Rotary Youth Exchange program as a scholarship. Exchange students go to school (at no cost to the student), live with host families (at no cost to the student) and receive a monthly allowance from their host Rotary Club. As with most college scholarships, the student’s family does pay for transportation, insurance and some incidental fees. 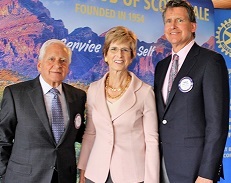 Former New Jersey Governor and EPA Administrator Christie Todd Whitman was a special guest speaker at a recent meeting of the Rotary Club of Scottsdale. Introduced by Rotarian Barry Kaplan during the club’s January 8 meeting at the McCormick Ranch Golf Course Pavillion, Whitman shared her thoughts on a variety of issues, including climate change, the high cost of seeking public office and the nation’s changing relationship with its most trusted allies. 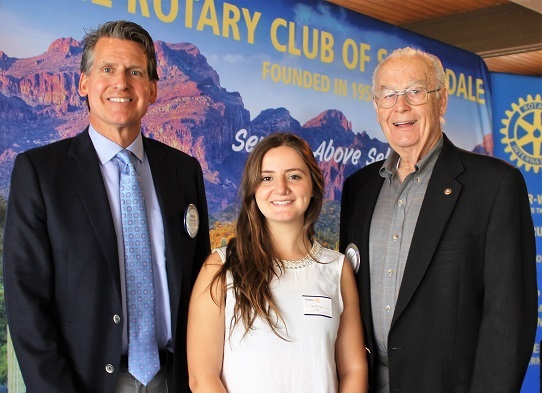 Max Rumbaugh, past club president, welcomed and introduced Valentina Cristi to Rotary Club of Scottsdale members and guests. Valentina, the club's 2014-15 in-bound Youth Exchange student from Coyhaique, Chile, visited the Club and her Scottsdale host families while on break from Universidad Mayor—a private university in Santiago, Chile. Valentina initially arrived in Phoenix on July 24, 2014 to spend the year as Rotary Youth Exchange Ambassador at Coronado High School. 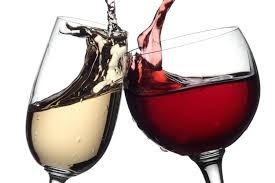 The Peoria North Rotary Club will hold its next Wine Classic featuring a three-course food and wine pairing on Sunday, February 17, 6 p.m. at Arizona Broadway Theatre, 7701 W. Paradise Lane, Peoria. The theme for the event is “That’s Amore.” Attendees will be treated to a three-course meal of Italian cuisine prepared by Arizona Broadway Theatre Executive Chef Erik Angelo. The meal will be paired with a selection of wines from the award-winning Francis Ford Coppola Winery of Geyersville, California. 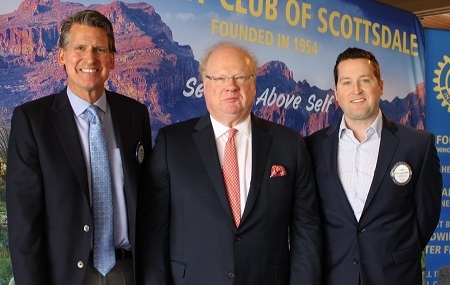 Rotarian Christopher West welcomed and introduced Red Conger, president/COO of Freeport McMoRan Americas to Rotary Club of Scottsdale members and guests at a meeting held at McCormick Ranch Golf Club's Pavilion. Conger has over 30 years of mining industry experience—21 years with Freeport-McMoRan Inc.
Conger stated that Freeport-McMoRan is the largest publically-traded copper producing company in the world with over 30,000 workers worldwide. The company operates seven open-pit copper mines in North America—Morenci, Bagdad, Safford, Sierrita and Miami in Arizona, and Chino and Tyrone in New Mexico. In addition to copper, molybdenum concentrate, gold and silver are also produced by certain of FCX’s North Americacopper mines. The company's first mine was discovered in 1881. The company's headquarters have been in Phoenix since 1987. On Friday, January 26, Phoenix Rotary 100 honored ASU President Dr. Michael Crow with its annual Career-Community Award of Merit. The award was established to honor someone who is not only stellar in their career, but also stellar in the community. The awardees should exhibit accomplishments similar to that of the late Mayor John Driggs, for whom the award was created. The past awardees have consisted of Sandra Day O’Connor and Jerry Colangelo, with Dr. Michael Crow, president of Arizona State University, as our third honoree. President Allister Adel introduced the award committee—Terry Gilberg, Past President Joe Prewitt, Adam Driggs and herself—who meets and decides on the awardee every year. Allister then handed over the mic to Terry Gilberg, who offered a little background on the award. PP Joe Prewitt handled the Q&A session with Dr. Crow. The Rotary Club of Scottsdale North will host its third-annual fundraising event on Saturday, March 10, to benefit Soldier’s Best Friend, a Peoria-based charity that aids veterans and rescue dogs. 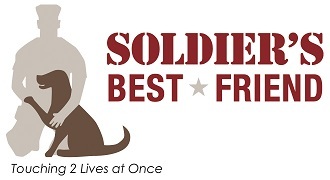 Soldier's Best Friend provides US military veterans living with combat-related Post Traumatic Stress Disorder (PTSD) or Traumatic Brain Injury (TBI) with service or therapeutic dogs, the majority of which are rescued from local shelters. The veteran and the dog work together with the guidance of Soldier’s Best Friend to build a trusting relationship with each other that saves two lives at once—and inspires many others. 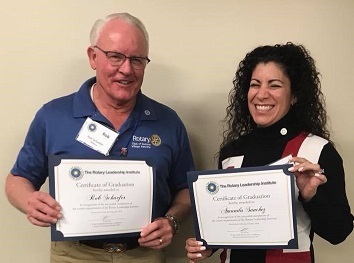 The Parker Rotary Club has an ongoing project with the Colorado River Community Crisis Shelter where they sponsor a room and completely refurbish it every other year. They paint and replace fixtures, furniture and linens. 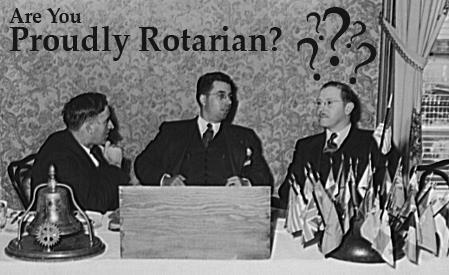 Ask a Rotarian, “What is vocational service?” and you may get a blank stare or you might get an “I’m not sure.” Every once in awhile you will get one of life’s little lessons on Rotary history as those who do know seem to have dedicated themselves to it. Vocational Service was one of Rotary’s “original” 4 Avenues of Service, and as such, much of the basics of what makes Rotary vocational service what it is today came from the foundations set in place by early Rotarians.